I’ll have to do another post later on what, exactly, I’ll be investing in with these accounts, but switching to Vanguard in itself should give you a good hint as to the general direction ;) Today, however, I pat myself on the back for taking the first step by moving institutions. Something I didn’t take lightly as I finally got all my financial accounts under one roof with USAA – still my all-time favorite company (just not when it comes to investments, since other places specialize in it). And I wanted to do it at a place that specializes in just that – no offense to USAA (If we’re talking car insurance or online banking, they’re pretty much the pioneers). Interestingly enough Vanguard is also owned by their investors themselves, which I later found out (and loved hearing). So in a way I now own part of a billion dollar company to boot :) The whole story of how Vanguard came about is actually quite fascinating, and would highly recommend learning about it if you have the time and interest. Start with their . The founder () is credited with creating the world’s very first index fund, and there’s even an entire forum dedicated to his vision at – pretty cool stuff. And I gotta tell you, I haven’t felt this good in a while. It’s nice to take action and move closer to financial responsibility :) After tweeting about it earlier too it seems I’m not the only one crushing on them either! In fact, every person I told after tweeting this only had good things to say about them too. I was pretty shocked to be honest, I couldn’t find any haters out there?? I even asked! Something else I was pleased to find was the EASE and QUICKNESS of moving everything over too. I literally had to create three brand new accounts (SEP IRA, Roth IRA, and Traditional IRA – which will later merge with my SEP which I never know was possible? (Yeah condensing! )), and then on top of that TRANSFER OVER all my 5 accounts from USAA too boot. Since I had so many set up for my crazy IRA Testing many moons ago (which I’m also happy to retire). I’ll report back once I have a better grasp on everything and invested in my new funds, but I just had to pop in and let y’all know what I’ve been up to lately. I highly recommend* you guys checking out too if you haven’t done so already. I’m sure they’re not for everyone (again, good time to speak up haters! ), but seeing how they currently hold over two TRILLION dollars worth of people’s money, something tells me I’m in safe hands. * I’m in no way getting compensated by Vanguard to share my opinions here. Believe me, I even asked if they had an affiliate plan since I was going to talk about them anyways, but since it’s all owned by members such as myself (with the goals of keeping costs low of course) they don’t even have a plan set up. Which just goes to show how even MORE awesome they are! People pimp them out for free anyways! Especially … you can’t read a full article without seeing their names mentioned ;) Which was what eventually led me to make the move. It seems that the Vanguard is really a good investment. Waiting for your updates! Please keep us updated. I am a fan of Tiaa-Cref and it’s funds BUT lately their fees are starting to creep up. On the other hand two of these funds last year returned 38 and 36 percent respectively…so I’m thinking “penny wise…dollar foolish” comes in to play…Your thoughts? jestjack – they were up that much because the whole market was that much. Nobody can predict where the market is going in any given year and nobody (except maybe Warren Buffett) can consistently beat the market every year. So with Vanguard index funds, you track the market – get those returns with the least amount of fees possible. Past performance is not an indicator of future earnings. The only “hate” I can throw on vanguard is that there is a fairly “high” ($3000) barrier for entry for most of their mutual funds. For someone starting out that could be something that could really dishearten them. Other than that, I have been pretty happy with Vanguard. They erroneously charged me a fee one time and one quick phone call later then reversed it and I haven’t had a problem since! Ah yes – good point about the $3k barrier. Totally missed that since it’s been a while we had less than that to invest. Guess it has to be higher though in order for the fees to remain low and provide generally great service? I’ve heard only good things and really want to jump on board. Can’t wait to hear more! No hate here! Vanguard’s fees are so low, it actually makes me chuckle thinking about it sometimes. I had a friend (granted who made a really poor investment, paying some guy 15% annually) what my annual fees were on my investments at Vanguard. He said, “what is it, like 1-2%” expecting to be jealous of THAT number. Try .05% – 1/300th of the fee he was paying!!! Other than that, I don’t have anything else to say about Vanguard, which is a good thing. It just tracks and goes along and I don’t have to worry about my investments until I need them, many, many years from now. Love it! I transferred over to Vanguard last summer from etrade. They have really low fees and its easy to conduct transactions. Even though they have relatively high ($3000) minimums for most funds, they have many ETFs that mimic the mutual funds that can be bought one at a time with no transaction fee. I use these to build up to the $3K amount, then buy into the mutual fund. My very first mutual fund investment way back in 1996 was in Vanguard Health Care. My dad gave me a Vanguard “why you should invest” book when I graduated college. I was hooked. I made the exact same move for the exact same reasons about 18 months ago. Transferred the brokerage and ROTHs to the sailboat! Couldn’t be happier. Awesome! I use TD Ameritrade and invest in the commission-free vanguard ETFs. I also have an account at Fidelity, although I don’t own any Fidelity funds there. I’ve been meaning to look into Vanguard. Vanguard was my first brokerage and they made it super easy to get things set up. Very happy with them. I don’t have all my funds with them though, because I get my 401(k) with Fidelity so it made sense for me to open an account with them as well (aside from my 401k). But you can’t really beat Vanguard’s low fees. I’ve heard great things about Fidelity too (my parents use them), just haven’t dove in really. It is nice having stuff centrally-located though, so I don’t blame you for sticking with them. It’s exactly why I stuck w/ USAA for so long! Many years ago I had one of their financial advisors provide an overview of my portfolio. To my horror, his recommendations included some of their actively managed funds. This from the creators of the best tool ever for individual investors: the Index Fund??!! This still shocks and baffles me. Thanks for putting all your thoughts out there for all us to see – you have no idea how much it helps people! 3 Fund portfolio until you know your AA, then make your switch with the new investments within your tax sheltered. Read bogleheads.org’s wiki too. Great resources there! Yes – all about simple portfolios right now! Will be doing 3, or even 2, here initially. My husband and I opened a Vanguard account this year. The only negative thing I can say is that they won’t let us name beneficiaries. It is a joint account, and when I questioned how to name beneficiaries, I received a form letter stating that it is not an option, and it is unlikely that we will die at the same time. True, it is unlikely, but not impossible, right? Legally, when you have a joint account, the other owner is automatically the beneficiary. If something happened, he/she would get complete individual ownership of the account and at that time could then name a beneficiary. That is the whole point of joint ownership with right to survivorship. Have you considered setting up a will? This would solve some of these problems. These can be set up fairly inexpensively too. Interesting discussion here! Hadn’t ever thought of this stuff, geez… freaky, but you’re right – never know what can happen! I like Brian’s idea of the will for sure. Nicely done. LOVE Vanguard! Bogle is the bomb. You will get to your financial goals faster than ever now! If you haven’t taken a look at his book “The Little Book of Common Sense Investing”, I highly recommend it. It will convert anyone to low cost index funds. Yes, even people who work in actively managed funds. Never even heard of it – will add it to my list! Very happy with Vanguard. My company 401k is set up with them. All good things so far. Here’s a question, what are the thoughts of Vanguard from my Canadian brothers and sisters in arms? Dude, I love Vanguard. I just finished rolling over old pensions into Vanguard accounts and I’m thrilled. I just wish my husband’s 403(b) was through Vanguard. It always pales in comparison to what we’re earning with our Vanguard funds! I love Vanguard, and I’ve had USAA in the past. 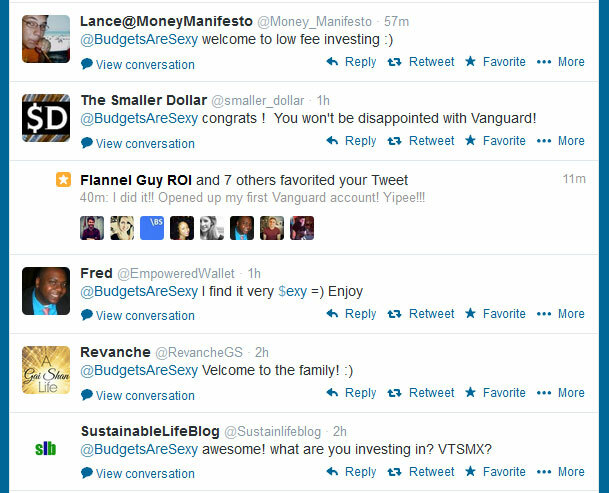 All our funds so far are with Vanguard. We’ve been with Vanguard for years. Never had a problem. We also recently started to use TD Ameritrade just so all our eggs aren’t in one basket. Both places have excellent customer service and research tools. Knowledgeable English speaking customer service technicians. Outstanding. I’m in the same boat! I don’t want to leave USAA, because of the “under one roof” thing and because I love them, but Vanguard it pretty sweet. I actually published an article yesterday on index funds and I included specific funds to use for retirement. I used USAA funds, but they only have 4, lol, so I also used a bunch of Vanguard funds and as I was looking at them, I started to notice that they were freakin’ nice. I’ve got my investments with Vanguard. I know that people have nice things to say about Fidelity as well, but I tried to help hubs make some choices about investments on Fidelity, and I could not figure out how to even learn about the options! Vanguard’s website is pretty easy to use, which is an added bonus, I think! I’m a boglehead and big fan of Vanguard. Still have a small portion of my portfolio in a different company. Been thinking about moving that over too. Is it bad to have EVERYTHING in one institution? Anyway, I don’t think you’ll find many haters out there but there are plenty of haters of low fee index investing which Vanguard promotes…though they also have actively managed funds (which have pretty low fees too). As a Boglehead, I’d recommend researching the 3 Fund Retirement Portfolio. If you want low fees and a lazy investment strategy, that’s the way to go. Already on it! That’s exactly the route I’d like to take here: smart and lazy. I switched over about a month ago from T Rowe Price. I initially chose T Rowe because I didn’t have a large portion to transfer over. Only thing I would check and I’m not sure if it’s avoidable, but I was charged a $20 admin fee from T Rowe Price to close out/transfer the accounts, so you might want to check the USAA docs or website to see if it’s similar. Boglehead, ha. Vanguard is my favorite for investments as well. I moved all my stuff over about 2 years ago and love it! You can’t beat their loads of choices (only use 1 target date fund though) and low cost. I am a Vanguard hater, especially for people who are not familiar with investing. I have used multiple websites and I have a handful of clients who use Vanguard and whenever we try to search or research the functionality is REALLY poor and they always say “I guess you get what you pay for.” Which is true. No bells and whistles is fine if you know exactly what ETFs or funds you want to put your money (especially if they are Vanguard funds, God forbid you want another fund) then it is fine. I just think they are not useful to those who are “new” to investing. My DH and I hold our US dollar investments with Vanguard and have no complaints so far. I don’t think you’ll regret the move! Over half my portfolio is with Vanguard and I could not be happier…and don’t forget as your assets grow stock trade commision reduce and financial planning service fees reduce. Good stuff. Yes – love that! Thanks for popping in. While I don’t personally use Vanguard, I have heard nothing but good things about them. Since I’m guessing you’re going to be investing in index funds, Vanguard is definitely the company to go with, you can’t beat their low expense ratios. Since I primarily invest in individual stocks, I’ll probably be staying with USAA for the time being. Good luck man, look forward to the updates. That’s crazy that you transferred over that many different accounts in 80 minutes on 1 phone call. That is definitely the detail that caught my attention! I’ve only heard great things about Vanguard as well. They seem to know what they are doing, that’s for sure. They will definitely be at the top of my priority list when I start looking into some serious investing. We’ve got about 50% of our investments at Vanguard, and well over 50% of our recurring investments head there too. If all our other investments weren’t in similar low cost accounts we’d transfer those too. All we’d have to gain now is the laziness factor, which can’t be discounted :) Also looking forward to hitting all Vanguard’s Voyager and Flagship personal service milestones. Next up 500k, then before you know it 1mil and 10mil :P Although based on JL’s comment I wonder how helpful their advisers really are. That would be a good problem to have though at that point :) I’ll be following you through each level too hopefully! Congrats! High fees eat gains and Vanguard is known for focusing low cost mutual funds and ETFs. I’m somewhat of a boglehead – even if I don’t have a Vanguard account, I still follow Jack Bogle and his philosophy. I’ve just kept everything with Fidelity (in their Spartan funds mostly) because I do like to play around a bit with stocks directly – that and the hassle of moving everything over. Good to hear that the transfer process went smoothly. Do the Bogle, Bogle. Do the Bogle Bogle! Welcome to the team, bro! You won’t regret it. Just make sure to read through JL Collins full stock series. I use Fidelity, but most of the major brokerages are similar. When you leave a company, you have a place to roll your 401K over too. The most important thing is to start, somewhere. Vanguard is cool. Easy access and useful! Way to go. As far as their “low cost fees” go, be sure to consider their Admiral funds. These are mirror images of their regular funds but requires a minimum $10k to invest (and limits moving funds to every 60 days) BUT the benefit to using these funds is EVEN LOWER FEES!!!! Other than my 401k & HSA (which I have no choice in), all our investments are with Vanguard, in index funds. The only thing I wish I’d thought more about was tax efficiency when setting my accounts up. Initially we set each account (e.g. – Roth IRA) with our asset allocation (so, 25% of our Roth was bonds, 25% was international, etc.). Later, we found could be more efficient tax-wise by putting all our bonds in tax-advantaged accounts, and to put the most tax efficient investments in our taxable accounts. Anyway, I wanted to share that as you’re just now making the switch…it might save you some money on capital gains if you’re selling/transferring/rebalancing. Guess I’m a boglehead since I’ve been there since 1995. No regrets in rolling my accounts under one roof. Like many others here, I’ve never had a problem! I think you should consider a few other accounts to your mix. – A “Cash” account. The key point here is that there are no restrictions in/out. Vanguard likes to spank people when they “time” the market. To avoid the perception, you sell from one account with the cash deposited into your cash account while simultaneously placing a buy from the cash account. Is this market timing or are you just on your toes to ride the wave? – An Individual/Solo 401(k). OMG. Vanguard began offering this in 2008 and I was all over this. Self direction at it’s best with just about all of their funds available to you. – A Roth Brokerage Account. Want to buy individual stocks? Depending on your portfolio value, you could have unlimited $2 trades..
Yup! I got a Roth Brokerage Account, as well as a SEP Brokerage one too for those exact reasons :) I still need to look into the solo 401k route (as many people have prodded me too over the years), just haven’t stopped to do so yet. I’m pretty happy with the SEP to be honest but I’m sure at some point it will make sure to switch – at least from what I’ve been told. You’ve been a Boglehead for 20 years now – way to go! Luckily I did research before opening accounts and avoided a lot of fees. I think I’ve spoken with someone at Vanguard once, and that wasn’t when I opened any of our three accounts. Since we’re still in early accumulation, we’re just going with a LifeStrategy fund. Once we’re investing in a taxable account several years down the road, I’ll make the effort to split it up and optimize our tax efficiency. Right now everything is tax advantaged so it’s REALLY easy. Bogleheads.org – best website on the planet? We moved over to Vanguard too- such an easy process and everyone was super helpful on the phone! I love their website too; so easy to navigate! P.S. Thanks for lumping me together with those other cool guys. That’s definitely a crew I’m happy to be a part of! Welcome to the club, I’ve had them for about a decade. Let me know what funds you get and how much dividends they pay. Vanguard has been great for me and it still sometimes amazes me how low their fees are compared to other companies. I will be with them for a long time and I’m sure there are many others who will also. I stumbled my way into a Vanguard account in 2004 because someone told me to. In 2009 I started looking into early retirement and found the bogleheads. Since I was lucky to already be set up with vanguard I just posted my info and got some free (but good!) advice…from then on…I was hooked! Boglehead here! You should read “The boglehead guide to investing” or “guide to retirement”. The books are such an easy read and really explain things in a simple way so anyone can be confident in planning their own investments. Exactly what I need too – an easy read! I get bored easily and having A.D.H.D. doesn’t help either :) Thanks for stopping by, d.
I just re-read the post and realized that you had said it didn’t require any paperwork for you… perhaps they have changed their process? 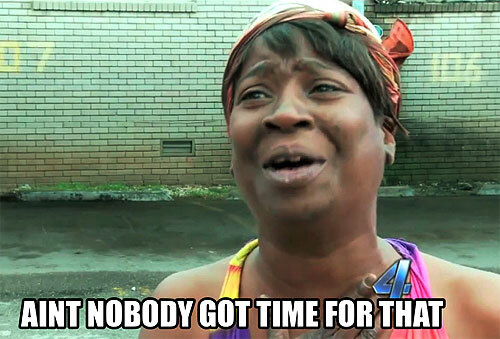 But they are making me fill out paperwork and send it in for each account (all within USAA too). After calling, they said there was nothing they could do and USAA requires it this way. I’m trying to remember how I did it, and I think I went through *Vanguard* and had them initiate the xfer if I’m not mistaken. I remember them saying that they weren’t sure how smooth it would be or not, but then after they started the process it all just started moving over! Sorry you had such a hassle :( But yay for moving over! Will def. be one of those one-time annoyances for lots of future benefits :) Congrats! I’ve been trying to setup my vanguard account for over a month. Not please at all thus far with the customer service or the “ease of setup.” I should note I’m not doing this incorrectly, I’ve done these before and do tech support for a living. Filling out a form isn’t rocket science. But each time I have it says it can’t verify my identity – despite them having my SSN. So guess who gets to print off a 18 page document and mail It in old school?! A joke thus far, it better be worth it once I’m done. 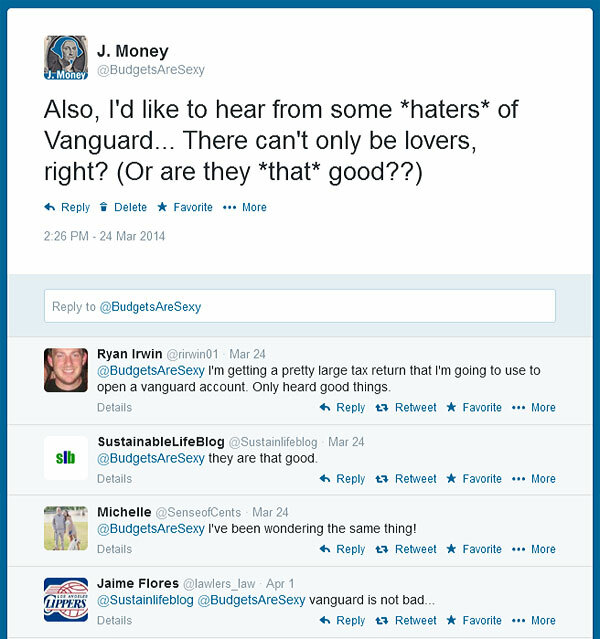 Do you use vanguard for personal investing or just retirement? Are there any blogs on here about starting a personal investment account? I am saving my “savings” money – ie. Ebates, savingstar $, ETC in a separate account and I’d like to build it fast! I am talking low starting amounts …. They round up your transactions and drop tiny amounts into a portfolio for you, but you can also push extra money over into it anytime you want to build it up. The nice thing is that you can start with $0 and go at your own pace, and they also help you build a portfolio of funds based on your own risk levels vs stock picking so it’s less volatile. Though it does cost $1.00/mo to use. I realize I am late to this article, but what advice would you give to investors who are attracted to Vanguard’s no-load funds, but who may not have the education or experience to manage their own accounts and choose the most appropriate funds for themselves and their investment goals? As someone who works in the industry, I can see how many people are turned off by sales charges that come with an actively managed portfolio, however, after going through several market cycles, nine times out of ten the ones who chose to invest on their own didn’t come close to beating the returns on accounts with an active manager, even with the fees. Unless someone is willing (and has the time and interest) to go out and do the research and choose the specific funds that best meet their investment goals, I struggle to recommend a Vanguard account. But that is just my opinion based on what I’ve come across. That’s why most of us in the $$ field go with *index* funds :) We’re all fine with tracking the market and being “average”, and fortunately that means not much management involvement! Previous post: Holy $hit – our baby is coming!